This easy sour cream coffee cake, from the famous Zingerman’s Bakehouse in Ann Arbor, MI, lives up to its well-deserved reputation. 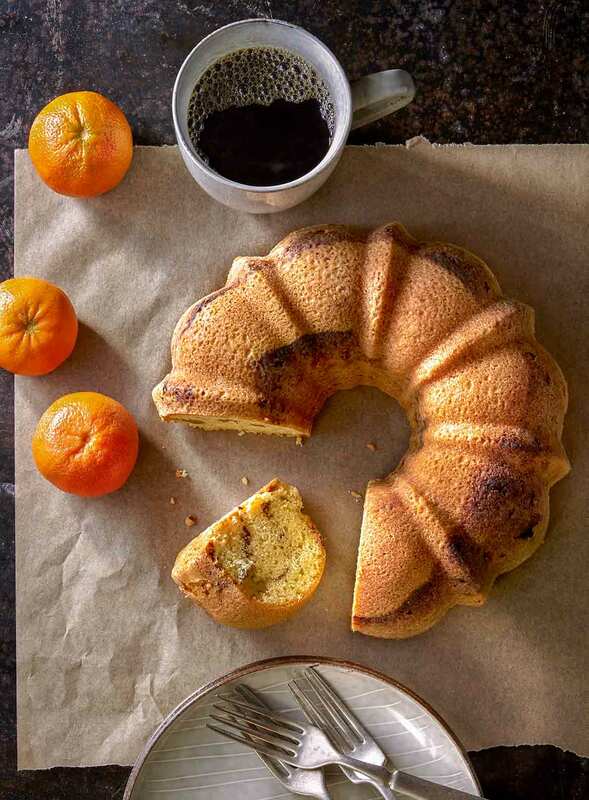 A cinnamon walnut filling swirls through a moist, buttery cake Bundt. Caution: Highly addictive. 1. Preheat the oven to 325°F (165°C). 2. Toast the walnuts on a rimmed baking sheet until they’re a deep golden brown, 10 to 15 minutes. Transfer the walnuts to a plate to cool. Turn the oven down to 300°F (150°C). 3. Finely chop the cooled toasted walnuts. In a small bowl, mix together the walnuts, brown sugar, and cinnamon. 4. Spray a 9-in (23-cm) Bundt pan with nonstick cooking spray and coat with flour. Tap out any excess flour. 5. In a large bowl, combine the sugar and butter. Beat with the paddle attachment of an electric mixer on medium speed until the color lightens, about 3 minutes. Add the eggs, 1 at a time, beating thoroughly after each egg until its completely incorporated before adding the next. Stir in the sour cream and vanilla and mix well until light and creamy. Scrape the sides of the bowl to make sure all of the ingredients are evenly incorporated. 6. Combine the flour, baking soda, and salt in a separate bowl. Gradually add the flour mixture to the butter mixture and mix by hand or with a mixer on low speed until smooth and homogeneous. 7. Scoop 1/3 of the batter into the prepared pan. Sprinkle 1/2 the nut mixture evenly over the batter. Cover with another 1/2 the remaining batter, using a spoon or spatula to spread the batter evenly over the pan and to the edges after each addition. Sprinkle the remaining nut mixture evenly over the batter and cover with the remaining batter, again spreading it evenly over the nut mixture. 8. Bake for 60 to 70 minutes or until a cake tester or skewer or uncooked strand of spaghetti comes out clean. Cool the cake in the pan on a wire cooling rack for 15 minutes. Do not let the cake cool in the pan for much longer than this or the brown sugar in the streusel might stick to the sides of the pan and make it difficult to release the cake. 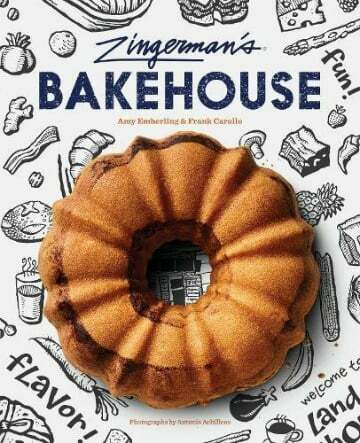 Make the sour cream coffee cake batter but omit the cinnamon nut swirl At the end of step 5 add 2 tablespoons grated lemon zest (preferably organic) with 1/3 cup freshly squeezed lemon juice and 1 cup ground poppy seeds (130 g) to the batter. Bake at the same temperature and for the same amount of time as the sour cream coffee cake. Zingerman's Sour Cream Coffee Cake ﻿ Recipe © 2017 Amy Emberling. Photo © 2017 Antonis Achilleos. All rights reserved. All recipes and photos used with permission of the publisher. This sour cream coffee cake is delicious with its crisp crust and buttery, moist center. The flavor is well blended with the vanilla, cinnamon, nuts, and butter. The sour cream really helps the cake stay moist. This is a winner in terms of taste and texture! This moist and delicious sour cream coffee cake comes together quite easily. My advice would be to have a hot cup of coffee ready for when you slice your first piece. You’ll enjoy the two together. Delicious! The cinnamon and nut swirl is what this cake is all about and it keeps you coming back for more! The cake itself is moist and not too heavy but just heavy enough to carry the filling. 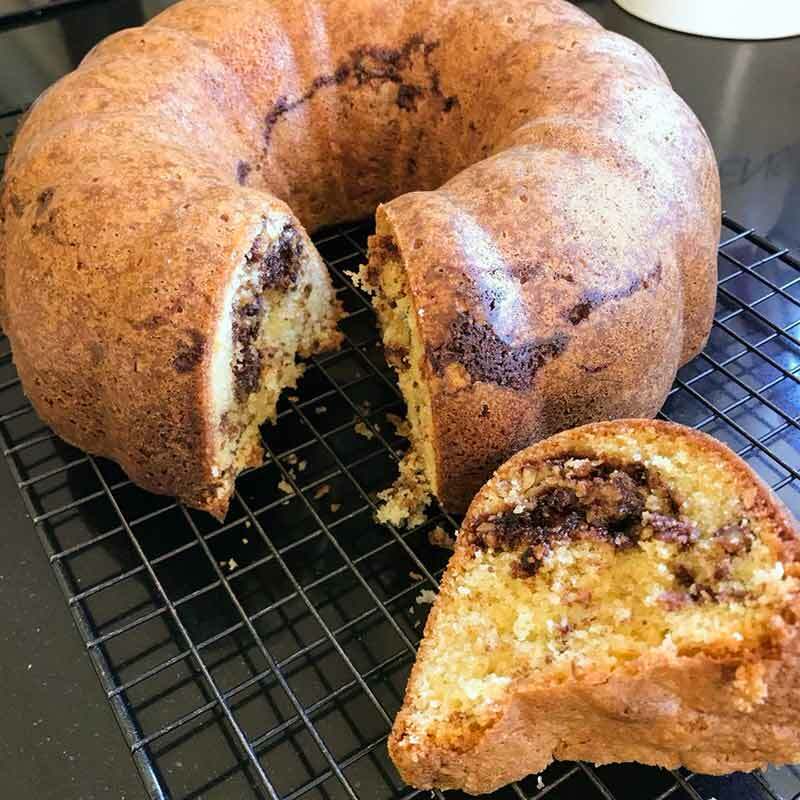 In between bites, I heard "Mom this is SO good.” and “Best cake ever!” The recipe is straightforward with uncomplicated ingredients and produced a wonderful cake. Mmmm. All-around familiar, reliably delicious coffee cake—we love you just the way you are. Not that we’d ever need to be concerned about the shelf life of a cake this good, but let me support the author’s claim that this cake does keep well at room temperature (long enough that you could enjoy it all by yourself—perfect if sharing isn’t your thing!). Like many fine-crumbed cakes, this coffee cake improved over time. As time went by, the buttery richness became more pronounced and the texture more uniformly moist. The walnuts became more tender and bonded with the cake more firmly, making it easier to slice through the larger walnut pieces. I think the quality peaked on day 3 and remained stable. After a week, the cake started to feel just a teeny bit dry, but the last piece on day 12 was still thoroughly enjoyable. One pointer. When filling the Bundt pan, 1/3 of the cake batter doesn’t seem much, so just spread it evenly with a back of a spoon to make a complete layer. I am really much more of a pie proponent than a cake fan, but if I had to choose cake, then it has to be like this one. It’s a rich Bundt cake. This is not fluffy, light-as-air cake and it’s really up my alley. I loved the flavor of the buttery cake set against the crunchy cinnamon walnut filling and it was the perfect accompaniment to a cup of coffee each day for more than a week! Wonderfully moist and delicious. A lovely treat for a cold winter day with its burst of lemon and crunchy poppy seeds. Whether you’re curled up with a hot cup of coffee or a cool glass of iced tea, this cake is the perfect accompaniment. It keeps really well and after 5 days the slices are just as moist as the first cut. Which means you can make this anytime, just for yourself, and enjoy a perfect slice every day until it’s all gone. No sharing necessary. How long do you bake the cake?? psjohn, 60 to 70 minutes. This cake is in my future! Heading off to buy a Bundt tin this morning and hope to be eating it by afternoon tea time! Amanda, do let me know how it turns out. And take some photos!! Suggestions for high altitude adjustments please. I live in the Calgary area and tested the lemon poppy seed version of this cake. I followed the ingredients in the recipe exactly but reduced my baking time to 55 minutes. I first checked it at 50 minutes and then gave it an extra 5. The cake turned out perfectly. We lived in Wyoming for 22 years at 7,400 ft altitude and now we’re an hour from Denver, Colorado at 5,000 ft. I haven’t made this exact coffeecake (but plan to very soon! ), but had wonderful results with similar coffeecake recipes in high altitude. I agree with Karen’s comment that sometimes in high altitude, cakes may take a few more minutes to be done all the way through. My Michigan relatives tell me that Zingerman’s is the gold standard of baking and I believe them. I’m going to be serving this coffee cake at a tea I’m hosting in several weeks. Thanks for sharing! Just to follow up on my earlier comment–I made this gorgeous cake the other day, following the recipe to the letter. 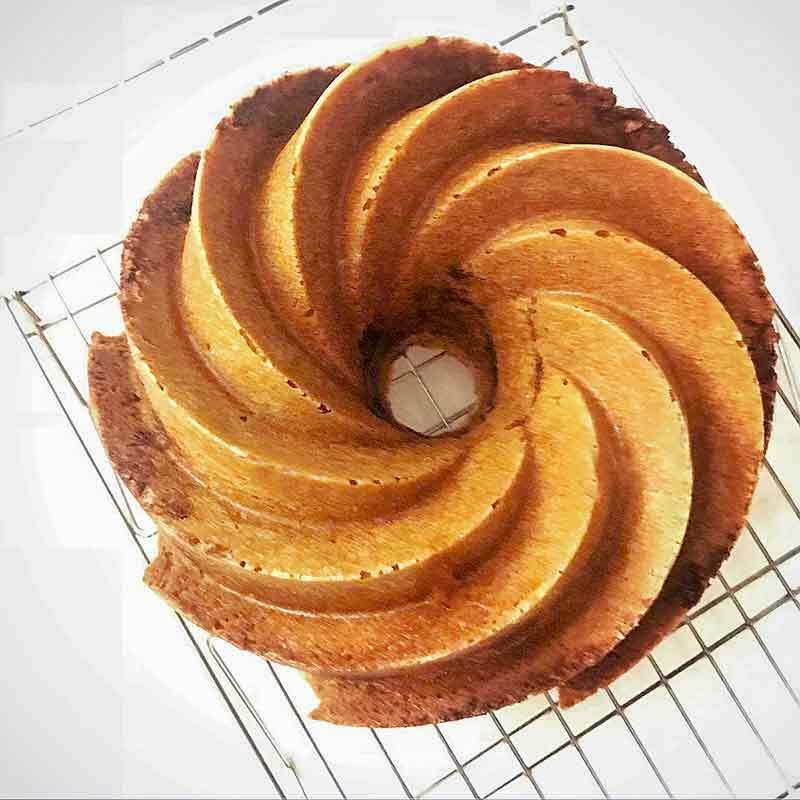 It was my first effort at a Bundt cake and was a resounding success–even down to a perfect ‘dismount’ when I turned it out of the tin. It’s wonderfully moist and buttery, with a delicious crust. There’s nothing I like more than a recipe that is well tested and works out the first time, and this is one! Amanda, I’m delighted you liked the cake and that it dismounted perfectly. But I’m blown away by your photo: It’s cookbook worthy! Just baked this most delicious cake. Measured the sour cream by using 1 cup less 1 tablespoon. Walnuts were hidden deep in the freezer, so substituted whole pecans, roughly broken. Baked exactly 65 minutes. A keeper! Yum! This is a stunner. I was looking for a recipe to use up a surplus of walnuts…but now I have a recipe for life. I was a little worried because the batter was quite thick and hard to spread evenly….but I did my best, and I don’t think it mattered in the end. Everything melded together in a swirling whirl of cinnamon-y walnutty goodness. See for yourself. Wow, Janet Stein, that is a stunner! You hit it out of the park. And in the end, I don’t think anything matters except taste. Hope you shared this with Momma Stein…! Can thus be made using cake flour? Lorraine, the cake will be too light. Coffee cake has a denser, tighter texture. I’d stick with all-purpose. Has anyone tried adding blueberries or other fruit? Sarah, we haven’t but I think berries would be a nice addition. Any suggestions for leaving out the nuts to modify for a nut allergy? Just do the cinnamon and brown sugar, or need to add something else for structure? Hi Erin, though we didn’t test the recipe without nuts, I think you should be fine to leave them out. Please let us know when you try the coffee cake. Lovely, Erin! Thanks so much for letting us know.